Note: If you'd like to see a copy of Dr. Gordon's PowerPoint presentation, look on our club website, to the right of the page under "Download Rotary Forms." When Dublin A.M. Rotary began helping Dr. Chrisanne Gordon start up the Resurrecting Lives Foundation (Chrisanne has offered special thanks to Faith Williams for grant writing advice and Mohan Viddam for veteran job assistance), nobody was aware we were harnessing a force of nature. It seems we did, however, as Dr. Gordon has empowered, suborned, pleaded, and simply worked to create a nationally known organization working for the good of veterans with Post-Traumatic Stress Disorder (PTSD) and Traumatic Brain Injury (TBI). To learn more about these conditions, which are affecting the lives of hundreds of thousands of veterans and their families, please read this white paper. Please click here to see Dr. Gordan's presentation to the club. Dr Gordons' Foundation is making a huge difference in the lives of our veterans and those who love them. 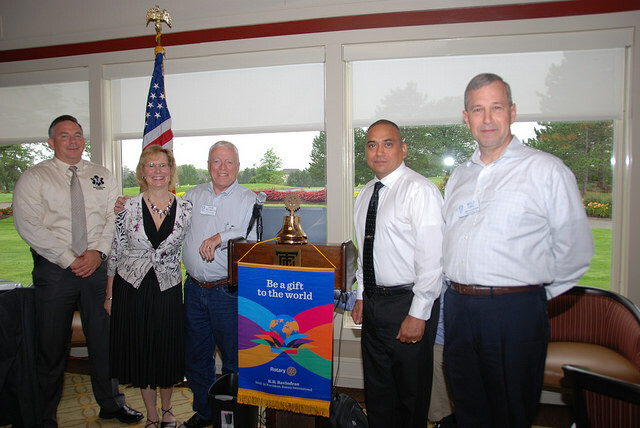 Rotary can be proud of the support we have offered.